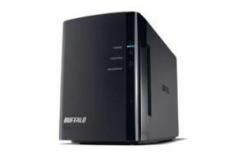 Buffalo Linkstation Duo 1TB review | What Hi-Fi? Buffalo's all-singing-all-dancing Terastation has long been a favourite here, and with the LinkStation Duo the company has tried to distil that into a more compact, affordable and consumer-friendly package. Whether you opt for this 1TB model, or one of the two or four terabyte versions, your dinky all-black case will contain two hard disks of equal capacity. These can be set to RAID 0 in order to get the full useable space, or RAID 1 so that one disk backs up the data on the other. You can access the drives by unclipping the front cover, and they're very easy to swap if a drive dies – or if you simply need even more storage. Another simple way to increase storage is to add an external hard disk. The Buffalo has just the one USB connection, so if you do attach one of these you'll have to do without a shared printer. This USB connection can also be used to directly copy files from a USB stick, but this is fiddly to do. While we're on the subject of niggles, we'll also point out that the LinkStation isn't calibrated to work with Squeezebox or Xbox 360. There may be work-arounds for these, but it's going to take some fiddling. Of course, for many people, none of that will matter. In which case you can simply appreciate the impressive gigabyte-to-to-pound ratio, ultra-simple setup and quiet operation. Calibration via web browser is very straightforward, and you can access your files (or upload more) from any web-connected computer. You can even play your music from your iPhone, so long as it's in an Apple-friendly format. So, if it's unfussy and affordable you're after, the Buffalo will do very nicely, but remember that you'll find more features elsewhere.